With the summer sunshine making rare appearances now and then many of us are contemplating getting our legs and arms out. This means exfoliating like mad to get rid of dull winter skin. If you like to cheat in the summer months with a tinted moisturiser or instant tan, exfoliation is a key step in your beauty routine. This is where NSpa exfoliators are here to help. Available exclusively from ASDA, these fruity shower scrubs are a great and cheap exfoliaitor. The shower scrub offers four fruity scents to choose from, Coconut, Vanilla, Lime and Raspberry. I recently purchased the Lime and Coconut scrubs. These were on offer when I bought them at 2 for £4, which is still running. To buy outside of the offer they usually cost £3 each. Still a bargain in my eyes! Marketed as a daily refreshing scrub, these are definitely gentle enough for everyday use. I like to use them with exfolaiting gloves for extra smoothness. This method of application is less gentle on the skin but it is the best for removing ingrown hairs, tan and an all over serious buffing of the skin if you’re planning on applying tan. I have used both products on their own by rubbing them in-between my hands and then all over. They foam much the same way as when I use them with exfoliating gloves but is a much gentler method of application and probably ideal if you have sensitive or dry skin. The Lime scrub smells so fresh and clean. It’s really zingy and zesty great for use in the morning as a ‘wake-me-up’. It is as you’d expect, a lime green colour with black seeds, a bit like frog spawn, as pictured below. The Coconut scrub smells amazing and won’t disappoint all you coconut lovers. A white gel with black passionfruit seeds. Once in contact with water these gels will foam enough to allow all over good coverage. I like to use a generous amount as I usually use this product all over my body. Both squeezy bottles contain 225ml of product. I have been alternating between the two bottles and although both claim to leave a light scent on the skin once rinsed off I fail to notice it. These really do smell so amazing that they come with a warning on the tube. Sadly the amazing smells doesn’t translate to your skin after your shower or bath but when you use the product the scent is at its strongest. 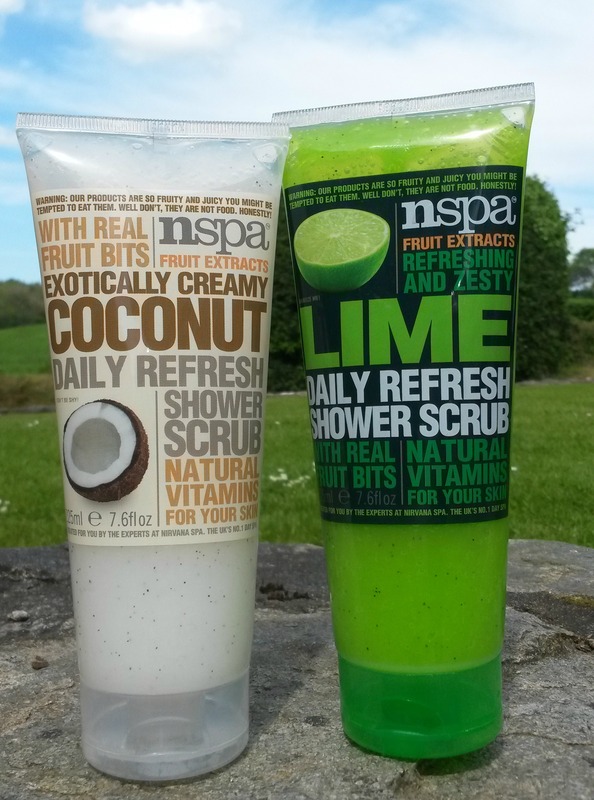 The NSpa range contains some great products, so far these scrubs are my favourite. They are a great option if you are on a budget or love using fruity products. For more info visit nspa.co.uk or asda.com. I’d love to know if you have tried these or any other NSpa products! 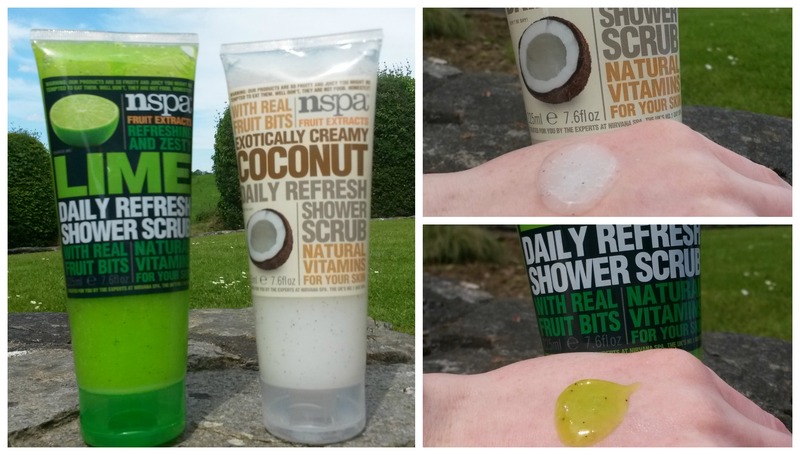 This entry was posted in Beauty and tagged ASDA, beauty, budget skincare, cheap products, Coconut, drugstore, Exfoliating gel, exfoliating gloves, Exfoliator, Lime, NSpa, NSpa products, Raspberry, review, scrub, scrubs, skincare, Summer skin, Swatches, Vanilla. Bookmark the permalink.